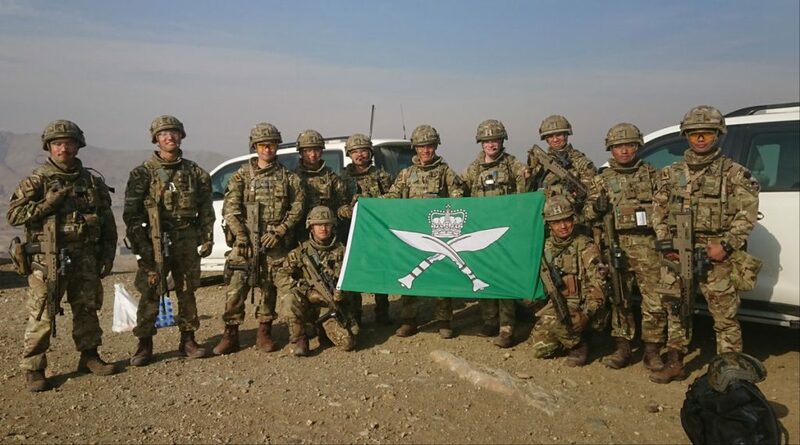 This page of our website will be used to keep you up to speed with the activities of the deployed element of 1 Royal Gurkha Rifles who are currently in Afghanistan on Operation TORAL. Operation TORAL is the codename for the British Army’s deployment to Afghanistan as part of NATO’s Resolute Support Mission to develop the military capability of the Afghanistan government’s Armed forces. 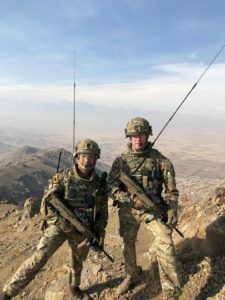 In October 2018 1 RGR LAD deployed on a six-month operational tour to Kabul, Afghanistan in support of Operation TORAL 7. LAD personnel were mainly situated in Hamid Karzai International Airport (HKIA) with manpower also in New Kabul Compound (NKC) and Camp Qargha (QAA). Come rain or shine the Vehicle Mechanics (VMs) of 1 RGR LAD were given the often-thankless task of inspection, service and repair of HKIA’s fleet of Foxhounds, Civilian Armoured Vehicle (CAV) and various other Vehicles. Without a purpose-built facility to work in, the VMs had no choice but to work outside in arduous and testing conditions. The months of January and February saw a lot of snowfall with the average temperature through the night of -14 Degrees Celsius! 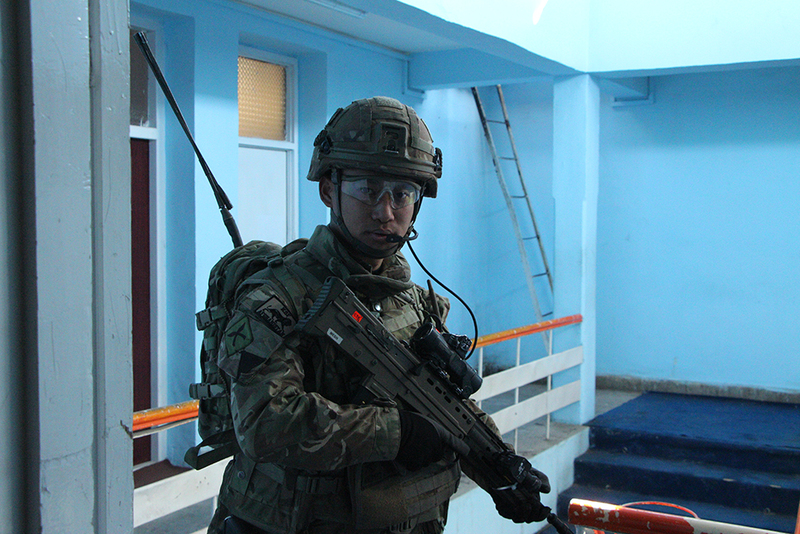 Also deployed on Operation TORAL were two Class One Armourers who had the job of maintaining a wide variety of weapon systems and sights over six different locations throughout the Kabul AO. Armourers are constantly bouncing around different locations ensuring operational effectiveness is never compromised. At the same time, we had one Recovery Mechanic attached to us. He is the back bone of our LAD. If any vehicles break down it is the job of the recovery mechanic to deploy on to the ground at short notice to recover the vehicle safely back to its base. In addition to our day jobs, we also help the QM’s department when flights are inbound and help with issuing kit to new personnel arriving in theatre. In their own time, the men have taken full advantage of the excellent facilities the camps have to offer and can be seen often playing Football, Ping Pong, Pool and Badminton. Overall we have had a very successful operational tour. As an LAD we have worked hard to ensure vehicle and equipment availability stays as high as it possibly can be to keep the kit in the hands of the users but on the other hand we have also had enough down time to ensure morale has stayed high. There is a saying in the Army: “The more you sweat in training, the less you bleed on the battlefield”. 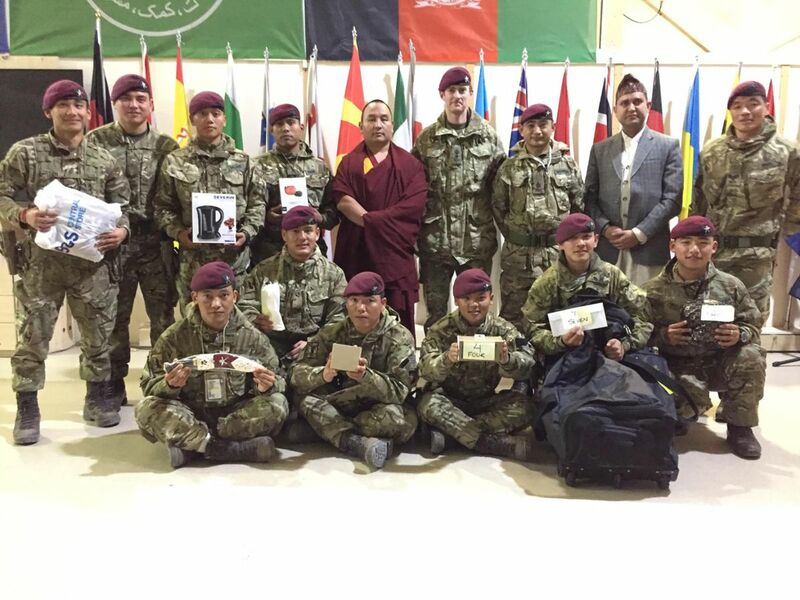 After a month of intense and focused pre-deployment training the 1 Royal Gurkha Rifles (RGR) Combined Joint Operations Centre (CJOC) team deployed on Op TORAL 7. 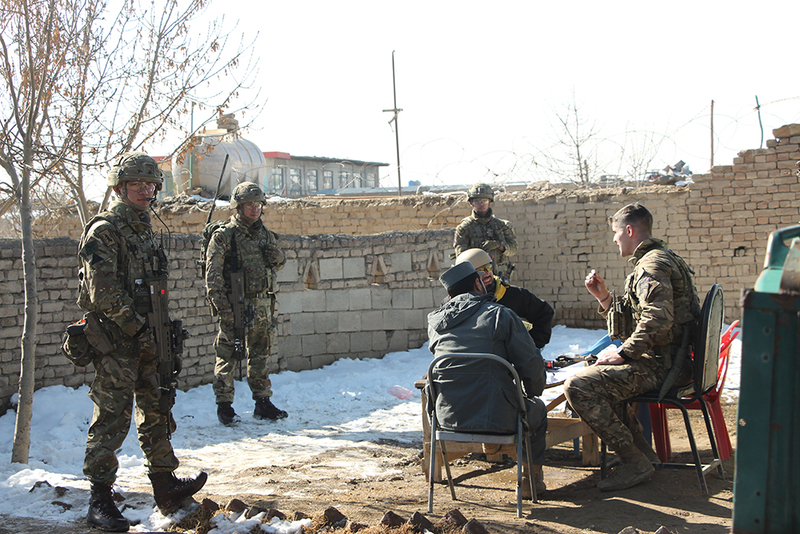 The CJOC team consisted of 20 personnel from 1 RGR and 4 personnel from 1 Royal Anglian. The CJOC is the Ops Room that controls all movement and incident response in the Kabul Base Cluster; a daunting responsibility for a new team. Every soldier dreams of deploying on operations and so with mixed feelings of excitement and nervousness, especially for those who were on their first deployment, we landed at Hamid Kharzi International Airport in October. After the completion of the mandatory RSOI package we flew to New Kabul Compound (NKC), which would be our home for the next 6 months or so. 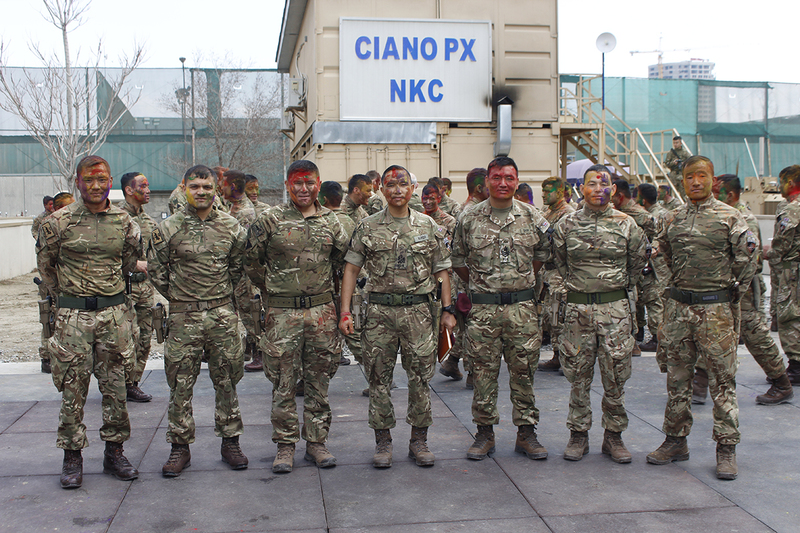 It was exciting to be based in NKC as it sits in the centre of Kabul and is close to the old Sherpur Cantonment where Gurkhas were based in 1879; we felt proud to be following in our ancestors’ footsteps. After a successful hand over from the Welsh Guards our team assumed control of the CJOC. 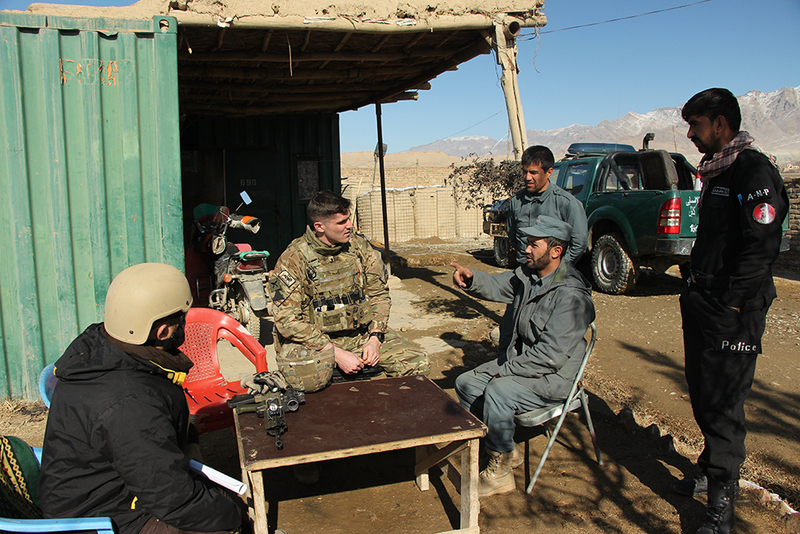 The CJOC was commanded by Chief of Operations Major Lou Connolly; an experienced Op HERRICK veteran with 3 tours of Afghanistan under his belt before Operation TORAL. We quickly settled into the CJOC, finding areas that we wanted to upgrade and innovating to make the CJOC even better than it was already. Most of us were from Signals Platoon so we were already acquainted with communication and IT equipment, but the CJOC was more advanced than anything we had seen before in a Battle Group HQ. The CJOC gave us access to many means of communications that we had to monitor constantly and we had a full suite of ISR feeds that scanned Kabul for threats. It felt like we were working in a NASA operations room that you see in Hollywood movies rather than a military HQ! As a signaller our average day involved communicating and tracking call signs deployed in Kabul. Every day there were incidents that interfered with this routine. These ranged from occasional vehicle breakdowns to “high profile” or “complex” terror attacks. We took these incidents in our stride and worked hard, often throughout the night, to resolve incidents and bring them to a close. Although we weren’t on the front line, we had a huge amount of responsibility in keeping deployed call signs safe in a mission where risk to life is synonymous with risk to mission. Within the CJOC we had soldiers from the USA, Mongolia, Turkey and Germany. Although we were from different nations we worked well together, combining our strengths with the ultimate goal of bringing security and stability to Kabul. The best part of being a soldier is it gives the chance to complete the mission and make a difference to Afghanistan. It is exciting to see positive change in Afghanistan, especially for those who deployed on Op HERRICK. Being part of the CJOC we have also gained leadership and management experiences in a high pressure environment. It was a pleasure to work with different units and nations; we have enhanced our understanding of each other’s culture and traditions. We are really proud and thankful for being a part of Op TORAL 7 and for the chance to contribute to the legacy of Afghanistan. Learning to wrestle Mongolian style. 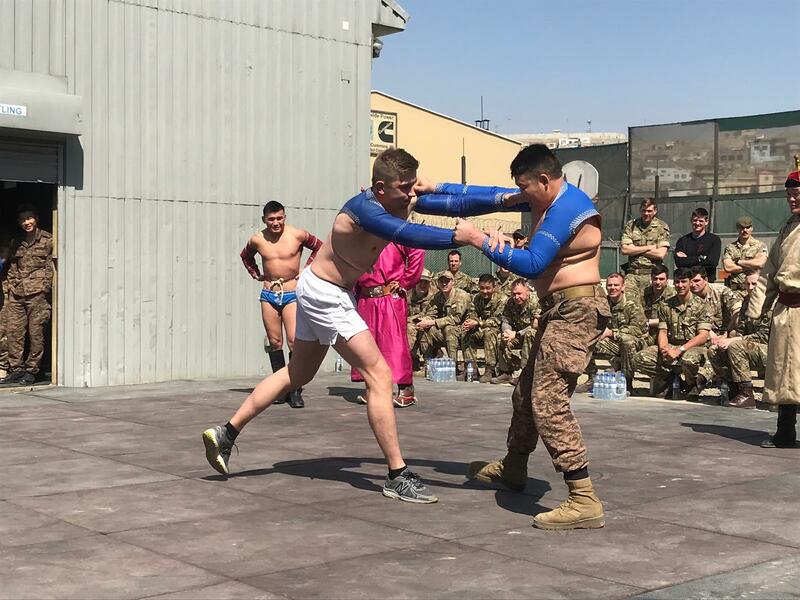 An interesting learning experience as our Mongolian Army partners showed us hands on about wrestling. A fantastic experience. A trip to an ancient fortress previously garrisoned by GR in 1879. 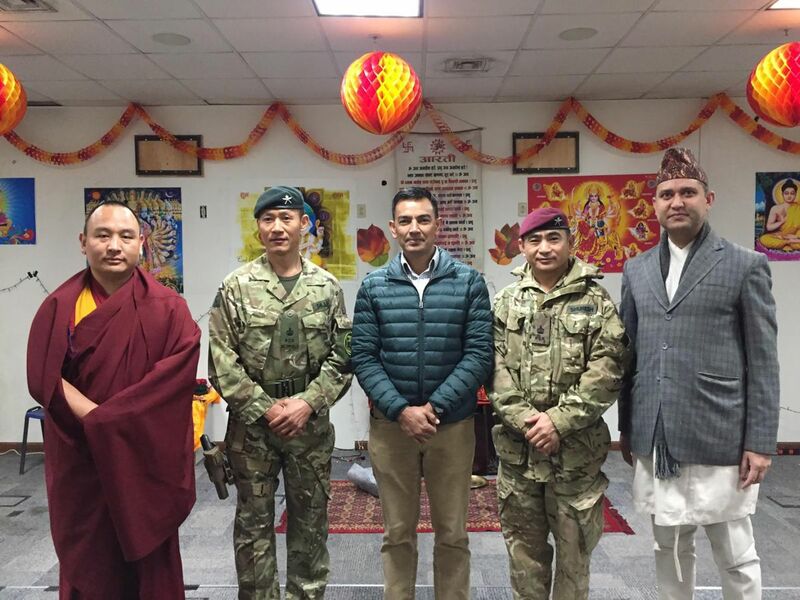 On 5th February 2019, the Gurkha Major (GM), Major Shureshkumar Thapa, arrived in Kabul along with Panditji, Lama Guru and the Regimental Career Management Officer (RCMO), Captain Babindra Gurung. 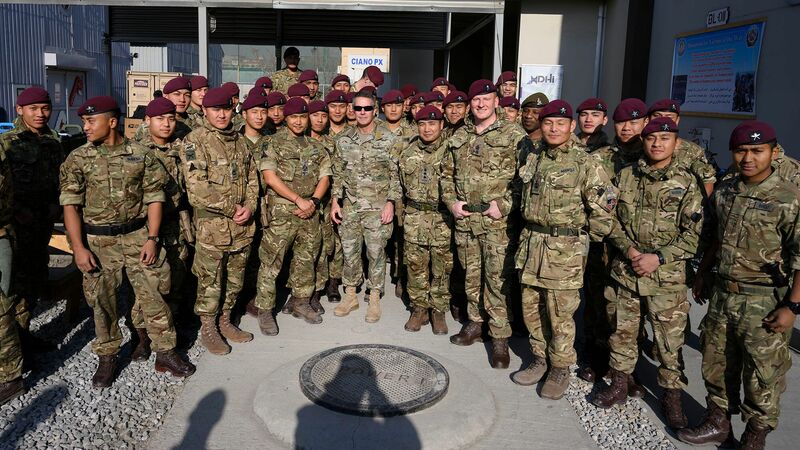 They were welcomed to New Kabul Compound (NKC) by Officer Commanding B Company (Coy), Major Tyrell Volker, as well as officers and non-commissioned officers from across the Kabul Security Force. 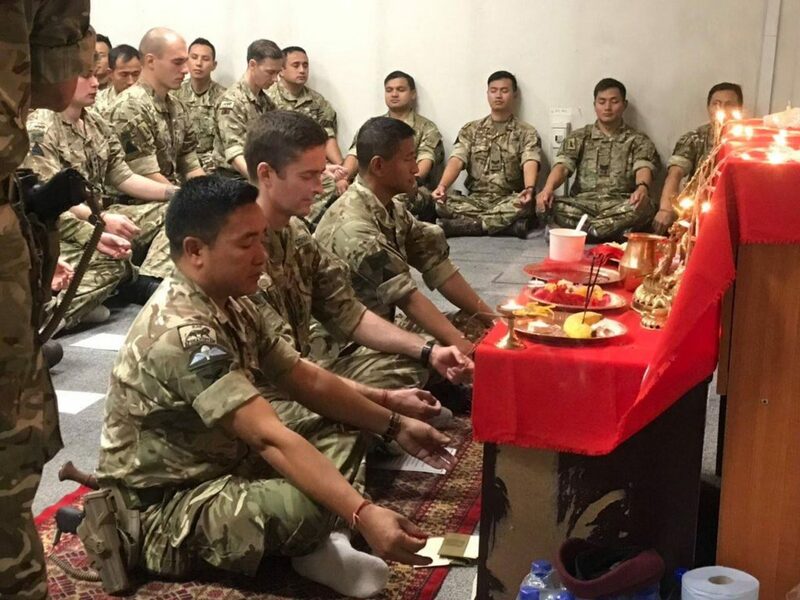 The following day, Panditji and Lama Guru led a temple service to pray for the entire battlegroup currently on operations in Afghanistan. Despite Adviser Force Protection tasks continuing throughout, each platoon was represented. GM Saheb and RCMO Saheb then spent the day meeting soldiers and officers from across the battalion. In addition, Panditji and Lama Guru provided support to individual soldiers, despite the busy schedule. 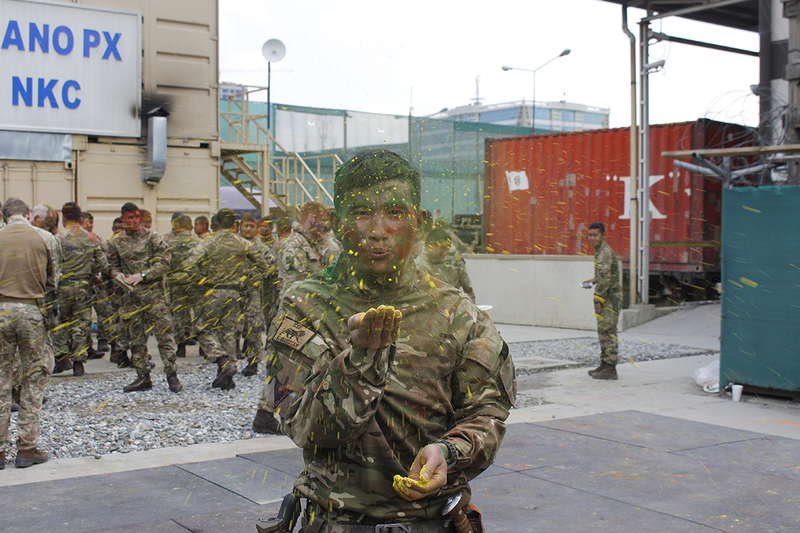 Junior soldiers from B Coy spent the following day preparing messing to celebrate GM Saheb’s visit, and to demonstrate the RGR’s unique kaida to other British units and multinational guests from Op RESOLUTE SUPPORT. This was to promote friendship and cohesion amongst the different nationalities in NKC. Brigadier Simon Scott OBE, Commanding Officer 1 RGR, Lieutenant Colonel Chris Conroy, and the GM each gave a speech. Luckily for our international friends they avoided Nepali! A surprise performance of the traditional kukri dance was also put on by B Coy for the guests. GM Saheb’s visit was unfortunately extremely short; however, it was vital to maintaining the high morale of B Coy and the strong link between our families at home and those serving on Operation TORAL 7 in Afghanistan. In the high-paced operational environment of Operation TORAL 7 in Kabul, it is important to have team cohesion to build trust and relationships. 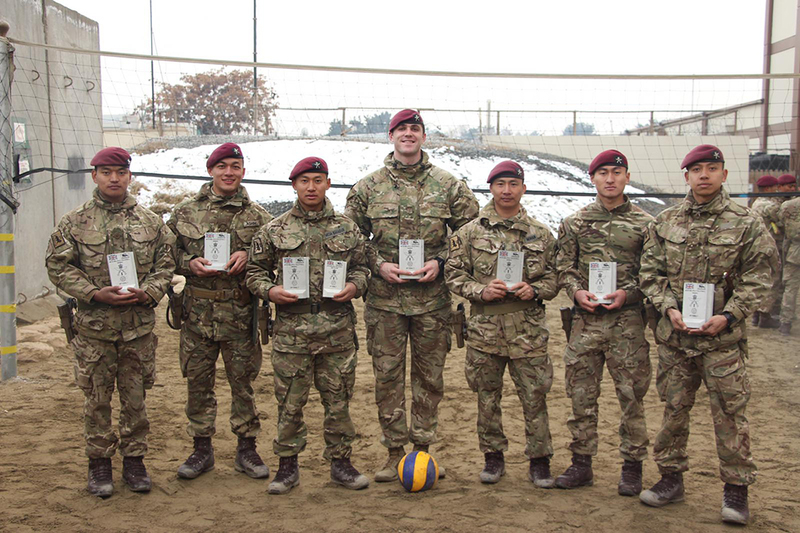 To that end, and when not on patrol, the teams based at the New Kabul Compound (NKC) have been making the most of the volleyball court during their down-time. On 1st February 2019, Corporal Mohan of the Police Liaison Detachment (PLD) organised a volleyball competition, to see which team could be crowned the best of 1 Royal Gurkha Rifles eight NKC-based callsigns. Indeed, B (Sari Bair) Company (Coy) Headquarters (HQ) was sure not to miss out on the action, and saw Company Quartermaster Sergeant, Colour Sergeant (CSgt) Bharat emerging from the stores for some ground-shaking spikes. The competition was fierce and closely fought matches drew crowds of American, Mongolian, Danish and Polish soldiers, as well as myriad contractors and Afghans. Rifleman (Rfn) Padam was a key attraction from the K32 team, occupying the centre zone with dominance and securing many points with aggressive smashes. The final saw the PLD and K33 go head-to-head for a chance to take home the miniature T-wall trophies. It was neck and neck until the last few points of the last set and both teams were tenacious in their plays. CSgt Bhim, of K33, harassed the PLD blockers with sneaky, well-placed drop shots but the PLD were able to clinch the victory at the very end. At the prize-giving, Rfn Mesh Bahadur Saru Magar (Captain of the PLD team) was awarded best player of the competition and commended for his resolve and contribution to team spirit. Officer Commanding and Second in Command B (Sari Bair) Coy shared some inspirational words, congratulating all participants for their competitiveness before resetting the focus back to the task at hand on Operation TORAL. During Operation TORAL 7, C (Mogaung) Company detached a single multiple to be based out of New Kabul Compound (NKC) with B (Sari Bair) Company – The PLD. 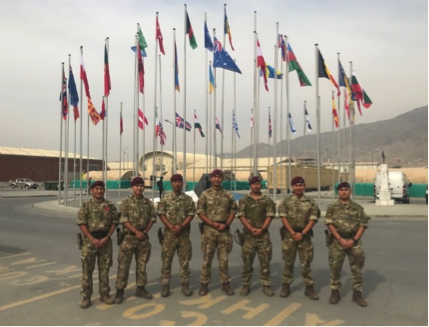 The Commanding Officer 1 Royal Gurkha Rifles (RGR) was especially keen to deploy the capability and see Gurkhas on the streets of Kabul, liaising with Afghan Police across the city. The PLD work under The Green Forces Fusion Cell to fulfil two functions, protect the Senior Police Advisor and coordinate intelligence for the Kabul Protection Unit intelligence cell. Specifically, the PLD was asked to generate an on-the-ground understanding of different areas in Kabul. In gaining that understanding, the PLD was engaged in aviation recces in Puma helicopters and daily Foxhound journeys across the city. For newly qualified Category C drivers, such as Rifleman (Rfn) Tara Bahadur Jhendi, Rfn Ashim Gurung and Rfn Bishwa Pratap Limbu, they got the opportunity to drive a £1million, seven-tonne armoured vehicle as their first car and have each accrued well over 2000km of driving experience during the tour. 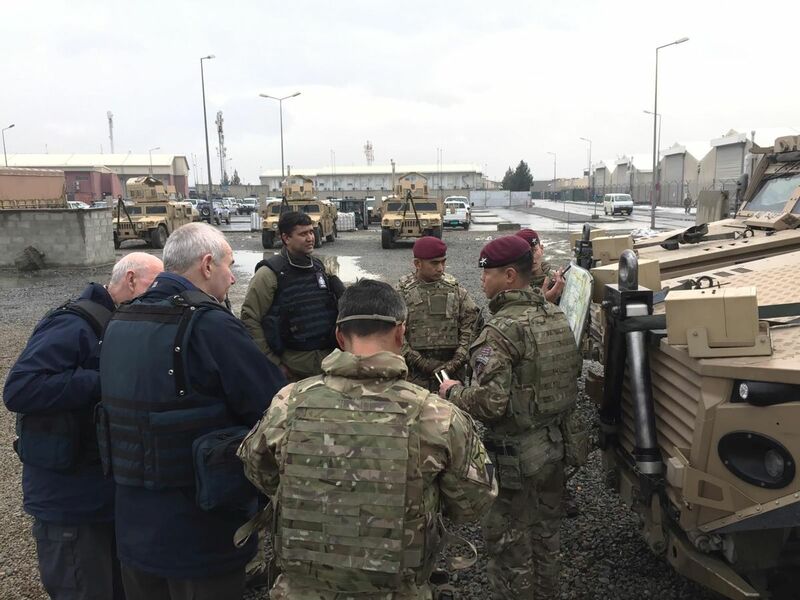 Moving in a three-Foxhound multiple vehicle set-up, the PLD visited each of Kabul’s 23 Police Districts, occasionally up to 30km from base and with the support from additional assets as required. A particular highlight were the tasks to Paghman, at an elevation of 2300m, where the multiple caught breath-taking views of the snow-clad Hindu Kush surrounding Kabul below and a frozen Lake Qargha. On task, the PLD liaised with Afghan police in a range of different settings from lavish, wood-panelled Colonels’ offices in district headquarters to broken, plastic garden tables surrounded by a single ring of concertina wire just off the Jalalabad Highway. The engagement between Afghan policemen and Gurkha soldiers was natural, facilitated by exchange of favourite Bollywood song couplets and countless cups of green tea. Certain soldiers with more proficient Urdu, such as Rfn Junkumar Pun and Rfn Amar Thapa, were able to share useful information for mutual operational benefit. When not on tasks, the soldiers of the PLD prepared a number of messing events, highlighted by the distribution of gifts on Christmas Day around the fire by our very own Rfn (Ba) Santa ‘Claus’ Rai. The PLD is still in the process of vindicating its volleyball reputation, having suffered a sore defeat at the hands of the Afghan policemen of Chahar Asyab District, but aspirations are high for the upcoming Company Volleyball Competition at NKC led by Corporal Mohan. 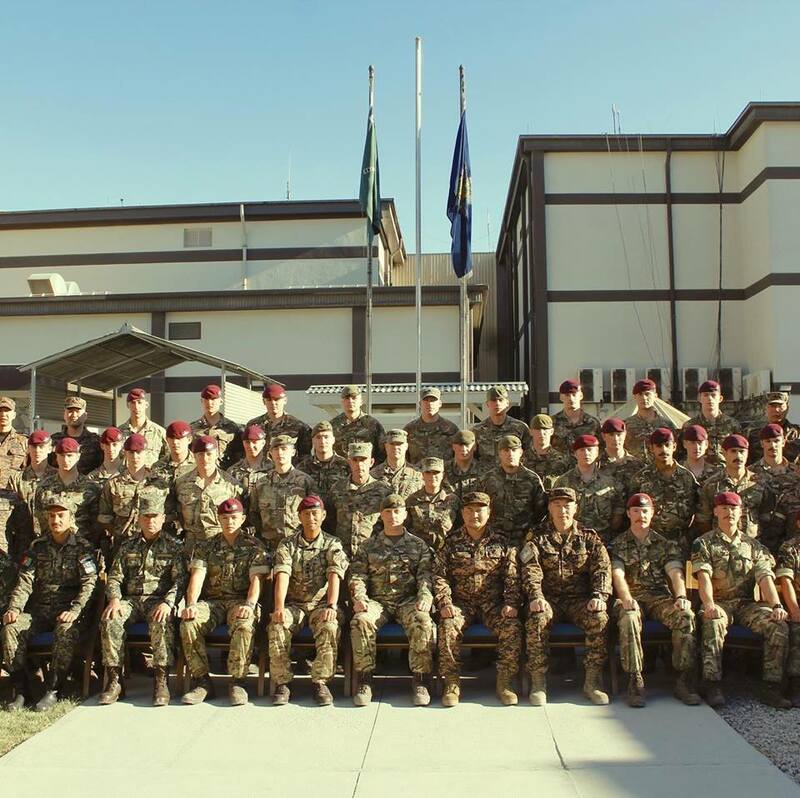 In mid-November 2018, B Company, 1 Royal Gurkha Rifles, took over the roles and responsibilities of the Kabul Protection Unit after deploying to New Kabul Compound (NKC), Afghanistan. We are part of Operation TORAL 7 and took over from the Welsh Guards. 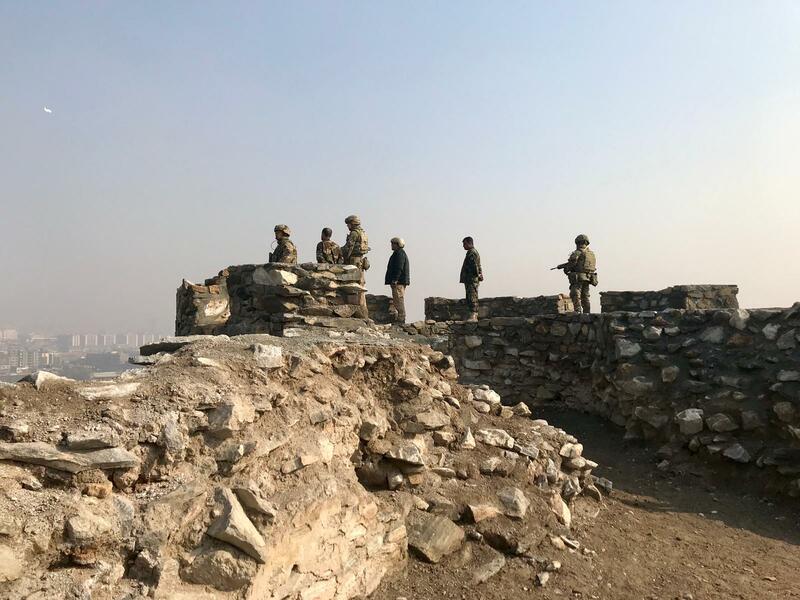 Since taking on the role, the Company has been undertaking the Advisor Force Protection (AFP) tasks around Kabul city as well as providing Quick Reaction Force (QRF) and Guardian Angels tasking’s here in NKC. On the 28th November 2018, at around 1830hrs, Camp Anjuman (a G4S base in Kabul) was attacked by a large group of insurgents. 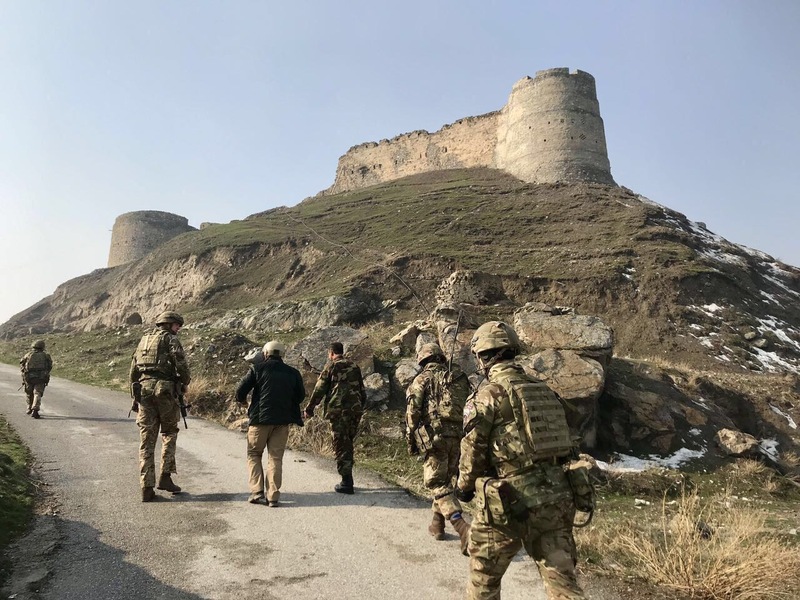 The assault consisted of a large Suicide Vehicle Borne Improvised Explosive Device followed up by a small arms attack by a number of insurgents. The camp housed a lot of Nepalese ex-servicemen, with a number of other multinational citizens. They were mainly working as G4S security personnel for the British Embassy and other places in and around Kabul city. As the incident took place the two QRF multiple of B Company were placed on high alert, ready to to support the Afghan security forces. We, K38, were lined up to support the aftermath. After a quick set of orders from the QRF commander to forward mount to Hamid Karzai International Airport (HKIA) nearer to the incident. Afghan security forces were dealing with the immediate event and we were to be responsible for casualty and personnel extraction. The Airport based unit helped with the immediate casualty recovery to the role two medical facility within the airport. We were on readiness for some time before we received final orders to move to the scene and set up an Incident Control Point. The difficulty was that a thick layer of fog/smog had covered the city and driving visibility was down to a few feet. However we managed to find a route through the fog and start the evacuation. When we returned back to base and conducted the post patrol action review we had mixed emotions. Although the incident had been stressful and unpleasant to see so many shocked and injured individuals, we were also very happy and proud to have been able to help. The Base Defence Operations Centre (BDOC) provides base force protection to the New Kabul Compound. 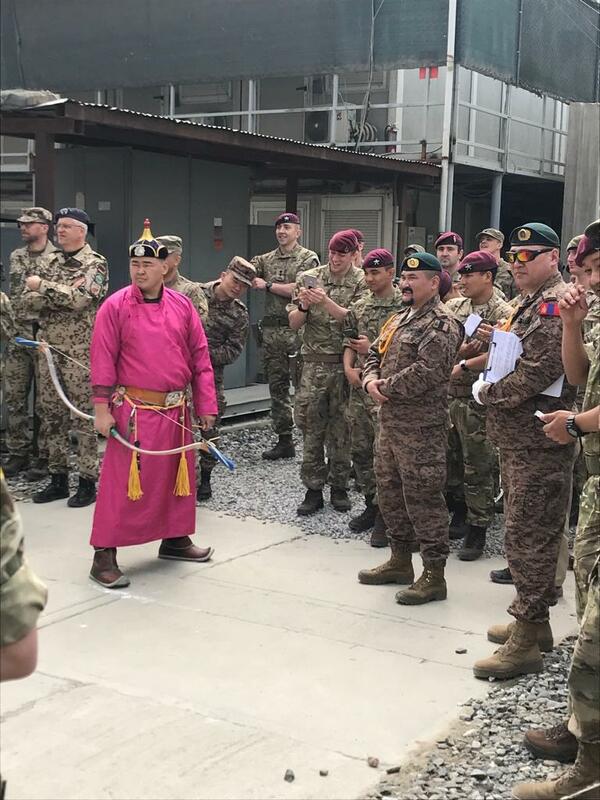 The BDOC is made up of troops from 1RGR, Third Battalion The Parachute Regiment and the Guards Parachute Platoon, The Royal Anglian Regiment, the Mongolian Expeditionary Task Force, the Afghan Public Protection Force and the US Base Security Group. Well done. 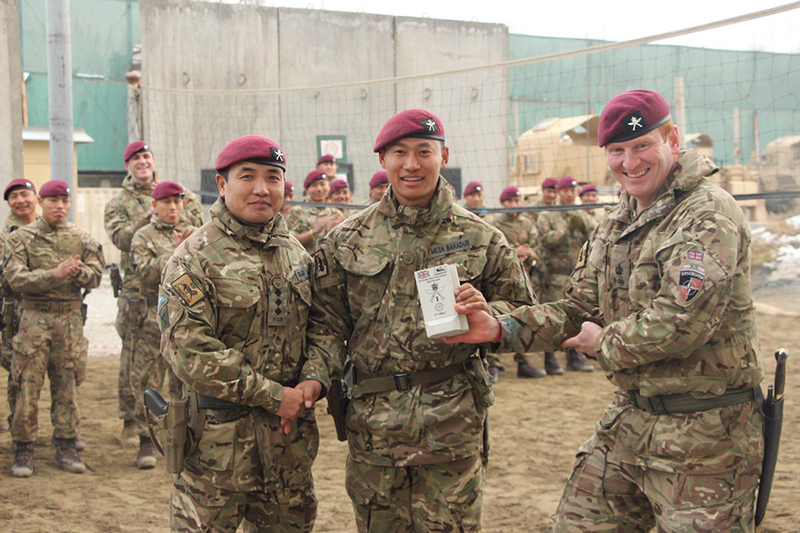 Rifleman Samir Thapa who won an International Table Tennis Competition run during Operation TORAL this week in Afghanistan, where 1 Royal Gurkha Rifles are currently serving. 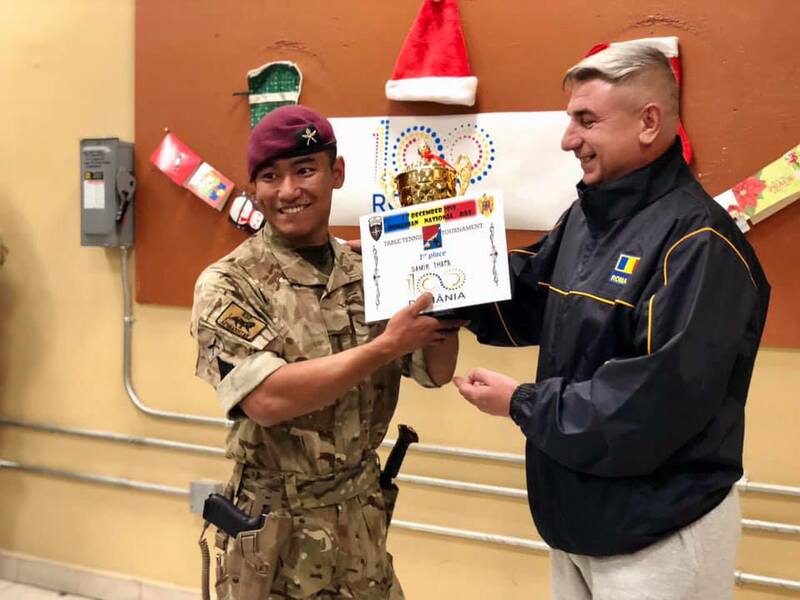 Rifleman Samir Thapa – who has competed in the Army Table Tennis Championships before had to win over some stiff competition but in good Gurkha style achieved the aim.. Competitive sport is an important part of life in the Gurkhas and wider Army and there are many opportunities for our soldiers to develop skills which in turn can help them on the battlefield. 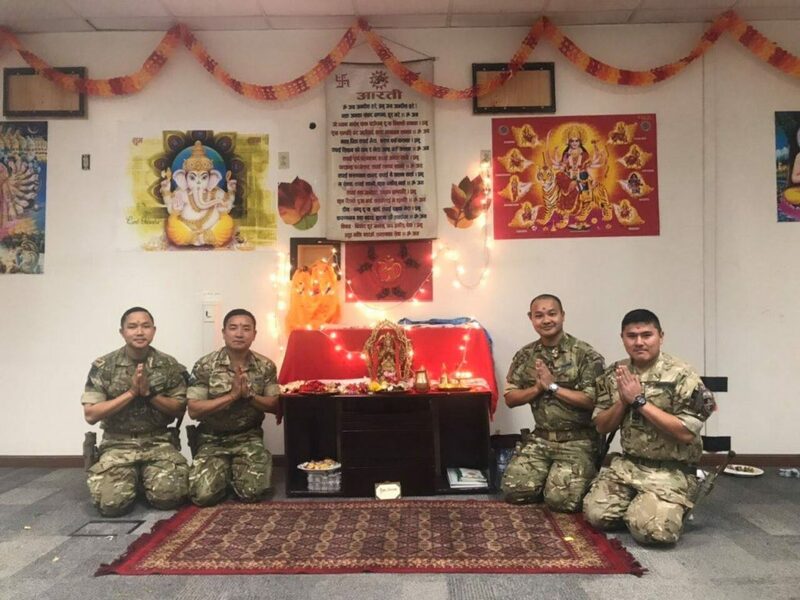 Gurkhas build a Temple in Kabul. The 1 RGR Battlegroup has opened a temple in the New Kabul Compound. The first service was held last Sunday. Spiritual practice is an important part of our kaida (tradition) and supports the moral component of fighting power. The Temple gives people of all creeds a place to bond and prepare to face the reality of operations. The Temple is open to all for reflection, worship, or socialising and will hold regular services. It is decorated with pictures of deities (including Goddess Durga and Lord Budha) and is equipped for prayer, Tika and even Yoga. 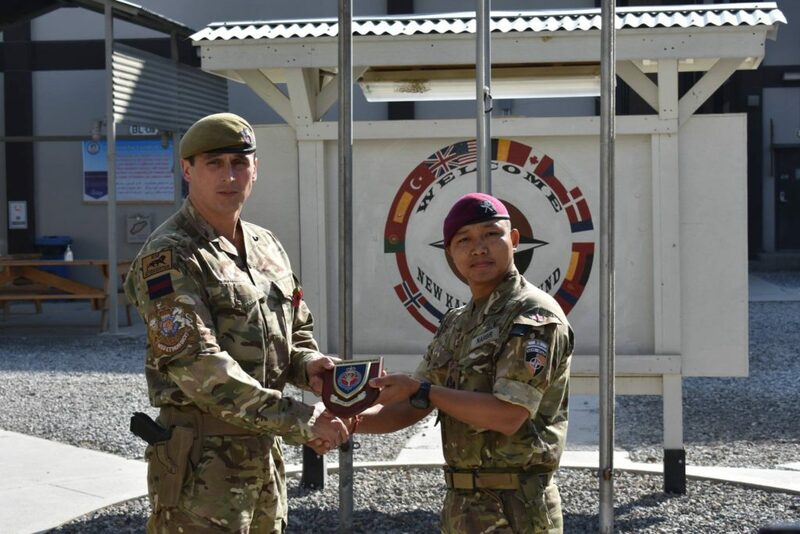 Part of 1 Royal Gurkha Rifles is in Afghanistan serving as lead unit in the Kabul Security Force, providing force protection to NATO’s Train, Advise, Assist mission. Members of C (Mogaung) Company Group have been patrolling in and around Kabul. 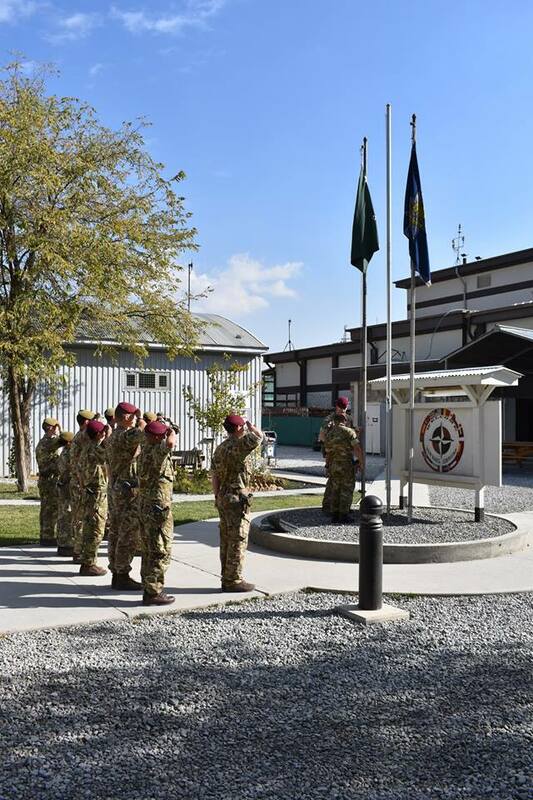 The Transfer of Authority for the Kabul Protection Unit between First Battalion The Welsh Guards and First Battalion The Royal Gurkha Rifles was marked at the New Kabul Compound by a short flag raising ceremony. The ceremony marks the formal beginning of Op TORAL 7 which will see 1RGR’s battlegroup (including elements of the Third Battalion The Parachute Regiment and First Battalion The Royal Anglian Regiment) responsible for providing force protection for UK and coalition advisors who are working with our Afghan partners to increase capabilities and capacity across the Afghan National Defence and Security Forces. Regimental Sergeant Major The First Battalion The Welsh Guards and Regimental Sergeant Major The First Battalion The Royal Gurkha Rifles exchange plaques to mark the occasion of the Transfer of Authority for the Kabul Protection Unit.